Putnam County Playhouse: "LOVE LETTERS" FOR EVERYONE IN OCTOBER! A new local theatre group is presenting Love Letters by A.R. Gurney at the Putnam County Museum. The event is a fundraiser for the benefit of the Museum. It will be presented Saturday evening, October 6, at 8 p.m. A Sunday performance with a brunch catered by Almost Home will be on October 7, with a 1 p.m. start for the meal and 2 p.m. curtain for the play. 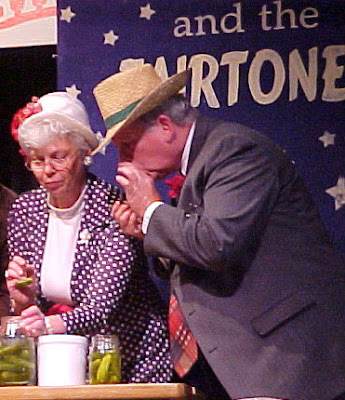 The show is a Reader's Theatre Production by the local group Silver Linings Players, a group for seniors interested in theatre and acting. It will star husband and wife acting team, Karen K. Temple and Ben Dulaski. The deadline for reservations for the Sunday brunch and show is Wednesday, October 3. Seating is limited but are still available. Reservations can be made by calling the Museum at 765-653-8419 or by visiting the Putnam County Museum at 1105 N. Jackson Street for tickets. Tickets are $10 for the Friday performance and $20 for the Sunday brunch and performance. 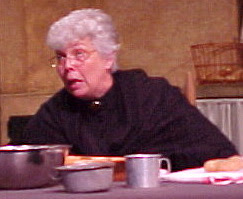 Love Letters was a finalist for the Pulitzer Prize for drama when it was first produced in 1989. Karen K. Temple - who is appearing in the show with husband Ben Dulaski - recently spoke to us about the experience. PCPH: Hi, Karen! 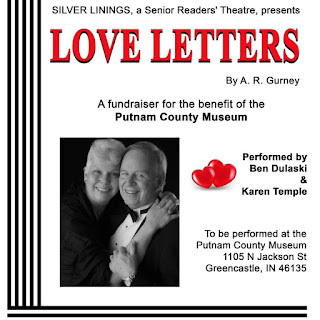 Before we talk about Love Letters, can you tell us a bit about your history with the Putnam County Playhouse? Karen: My first show at PCPH was 42nd Street [directed by Vickie Parker in 1996]. I picked up my Halloween costume tap shows and showed up at auditions with my second grade tap class moves. I was completely over my head, but I was cast. I used to go our on the front porch at 2 a.m. to practice.....I couldn't sleep for being terrified.... After that, I just kept auditioning and was lucky enough to get cast in about 20 shows since then. PCPH: Do you have any particular roles you have especially enjoyed? Yente in Fiddler on the Roof . 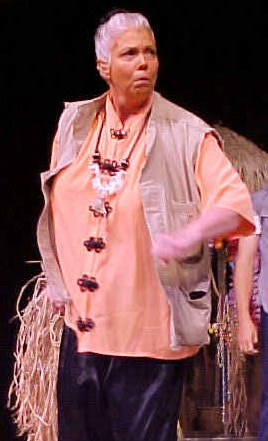 As Bloody Mary in South Pacific in 2003. PCPH: I know you and your husband have both been involved in PCPH, have you done any shows together here? Karen: Ben and I started dating in 2003, and we got to do little parts together for State Fair [directed by Vickie Parker in 2004] where we got to waltz together. And there was Singin'in the Rain [directed by Ric McFadden in 2008], and Don't Drink the Water [directed by Jim Rambo in 2011]. 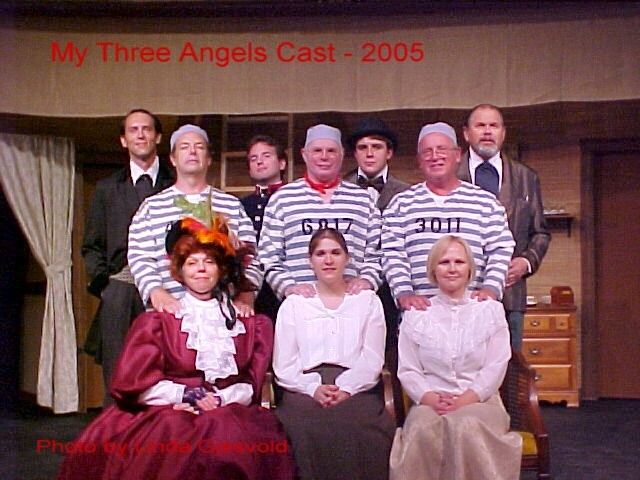 We also did My Three Angels [directed by Ernie Ford in 2005] together. Ben also did several small parts in The Sound of Music [directed by Ernie Ford in 2006]. The plays we got to do together have been the most fun! PCPH: Have you always been interested in theatre - did you do theatre in school? Karen: I did all the theatre in junior high and high school that they would let me do. I was on the speech and debate team, too. I majored in Speech Education at Purdue, but I only did one theatre production there. I moved to Putnam County in 1992 and discovered this great venue. Ben also did theatre in high school and played the lead in Father of the Bride at Bedford Community Theatre in the 1990's. In I Remember Mama in 1998. PCPH: Where did the idea for your group Silver Linings Players come from, and are you still actively seeking participants? 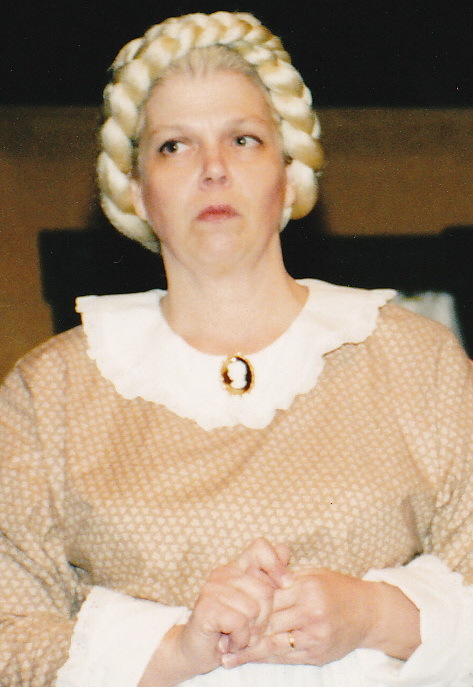 Karen: Linda Ford contacted me about Silver Linings Players, a Readers' Theatre. Kathy Stephan had the idea to harness all of the "grey power" in the couty, some of who couldn't do high kicks or memorize scripts any more. Linda thought of Ben and me, and when I mentioned it to Ben, he was all for it. My Three Angels cast. Karen front row left, Ben second row right. We've had a lot of fun. No costumes, no scenery, no memorization. We let the plays speak for themselves. Most of what we do is comedy. Usually short readings of 10-25 minutes at most. We have mostly performed for senior centers. and we have a good group of participants, but we would always encourage more folks. A few of our members are trying their hand at writing short pieces for future performances, and one is working on a full length script. Our meetings are at the Putnam County Museum on the first and third Mondays of each month. They run from 11:30 a.m. to 1 p.m. We usually go out for lunch afterwards. Ben and I have met a lot of new people with a wide variety of backgrounds and are enjoying it a lot. We welcome anyone who is interested to join us. PCPH: Tell us about Love Letters and how you came to choose it for this event? 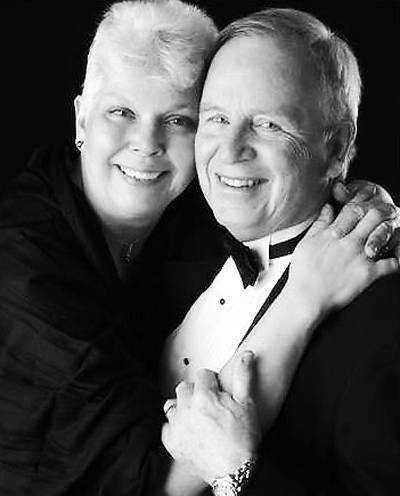 Karen: In 2004 or so, Ernie Ford approached me about doing Love Letters with him as a fund raiser for the Heart Association at the Walden Inn on Valentine's Day. I had never heard of it before, but it was an easy sell. Love Letters is always done by reading the letters which comprise the play; the author expressly prohibits memorization. Ben helped me rehearse and said to me at one point: "You and I should do this sometime." I agreed. 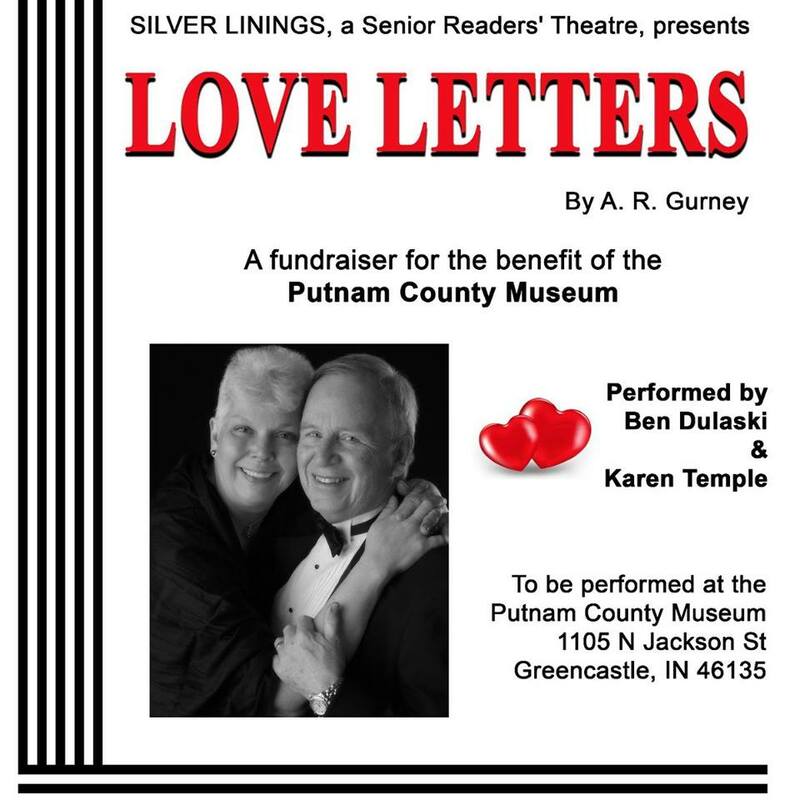 When Silver Linings was asking for ideas for a fund raiser for the Putnam County Museum, I volunteered Ben and me. This is play that continues to grow on you. It's a very powerful piece. There are only two characters - all of the lines are from the letters they wrote to each other over a 50+ years period of time. The play begins in 1937, with letters that they wrote to each other at seven years old. He is a very strait-laced young man who grows up to meet his father's expectations - including a seat in the U.S. Senate. She is an artist, a free spirit, and a wounded bird. Every time I read it, I find another nuance in their relationship that I had overlooked. Every time I read it, I read it, my feeling that "...there but for the Grace of God go I..." intensifies. PCPH: How do you think theatre makes a difference in the lives of those who do it and those who watch it? Karen: Theatre transports us to other worlds - like reading does, but with more social interaction! Plays like Looking Over The President's Shoulder for instance, teach us history in a painless way, one individual at a time, by involving us emotionally. I have formed some of my closest friendships by participating in plays, both by discussing life and general, and the microcosm that you are portraying. This play is about writing letters, for Heaven's sake! Who does that any more? How did the lack of the instant communication we have today benefit or hold back a relationship? PCPH: Anything else you'd like to add? Karen: This is a full length production, approximately 1 hour and 45 minutes. We will be selling beer, wine, and soft drinks at the 8 p.m. performance on Saturday, October 6. Almost Home is catering the Sunday at 1 p.m. brunch, and the performance will begin at 2 p.m. We've sold enough seats to have a respectable showing, but we still have seats left. [Reservations for the Sunday brunch/performance must be made by Wednesday October 3]. This might be the best thing I ever get to do, so I hope we have a full house! It's for a great cause - the Putnam County Museum is a treasure for our county! PCPH: Thanks, Karen. We wish you a great success with this show, and with the Silver Linings Players! Wow... thank you so much for posting this! I am honored. I think it's great that an over-the-decades successful community theater is supporting a little start-up like Silver Linings. Great interview with Karen!